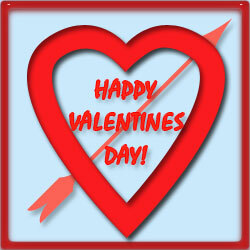 Free Valentine's Day graphics and clipart of cupid and cats for download. Page also includes hearts, flowers, I Love You signs, animated roses, balloons, teddy bears, puppy dogs, Happy Valentine's Day signs and more. Two cats looking cute and a large red heart. I Love You with animated flowers. A dozen red roses animated. Red hearts with cupid's arrow and Be My Valentine. 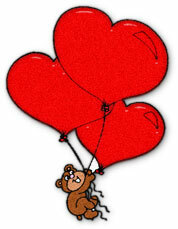 Bear flying thanks to 3 heart shaped balloons. Cupid with wings plus his bow and arrow. Young cupid with wings and bow. Puppy with an animated heart balloon. Cupid showing off his skills - animation. Animated Cupid flying through the air with ease. Be My Valentine on pink glass. I Love You red hearts. 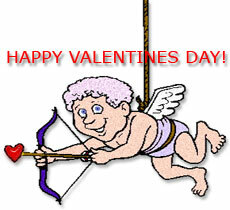 Happy Valentines Day with Cupid. Flying cupid with Happy Valentines Day. Cupids with hearts at sunset. Happy Valentines Day red with yellow and blue hearts. code for Happy Valentine's Day with yellow hearts. Man and woman with hearts and I Love You. Man is clearly in love or he needs a doctor right now. I Love You bear with animation. Be mine with heart and wings. Be My Valentine - Powerful Love. Spinning Be My Valentine animation. Big hug for my friend. Heart Valentine animation with Love. Happy Valentines Day with heart and arrow. 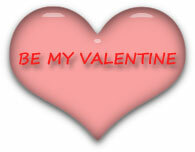 Be Mine animation with red heart. Be My Valentine or Else. Perhaps a box of candy would have been better? Some girls simply know just what they want for Valentine's.